Palo by any measure is an all-star restaurant. We would happily pay twice as much money on shore for the same experience. The service is top notch. The food is amazing. And to top it off, you can eat as much as you want. It is a steal at $30 per person. Everything has been thought of and the team at Palo is so incredibly accommodating. We loved our server Ilaria so much we requested her the next time we came back – and we did. And this time we brought friends and table mates – Kendle and Chad. Palo’s dinner service is amazing, but imagine adding an all you can eat buffet on top of it and you have Palo brunch. I hesitate to call it a buffet because it usually means good but not great food. You trade abundance for quality. But at Palo, that isn’t the case. With selections like caviar, smoked salmon, and lobster salad (which is code for lobster with a little bit of other stuff – not a bunch of stuff with a pinch of lobster), the quality is top notch. They have a great selection of aged cheese, sliced meats, seared ahi tuna, sauteed mushrooms, salmon mousse, crab legs, mussels, and shrimp in bloody mary cocktail. Not to mention the nice selection of pastries and breads – my favorite was the hot sticky buns of which I had three. There’s even more on the dessert table including tiramisu, blondies surrounded by chocolate, chocolate covered strawberries, lemon meringue parfait, cannoli, panna cotta, pistachio slice, champagne jelly with fruit, fruit tartlets, and this thing they call baked yoghurt with mango salsa but it tasted like heaven. Did I mention you ALSO get a main entree and soup? Or two main entrees? Not that you could eat it after hitting the buffet. But the entrees are amazing. 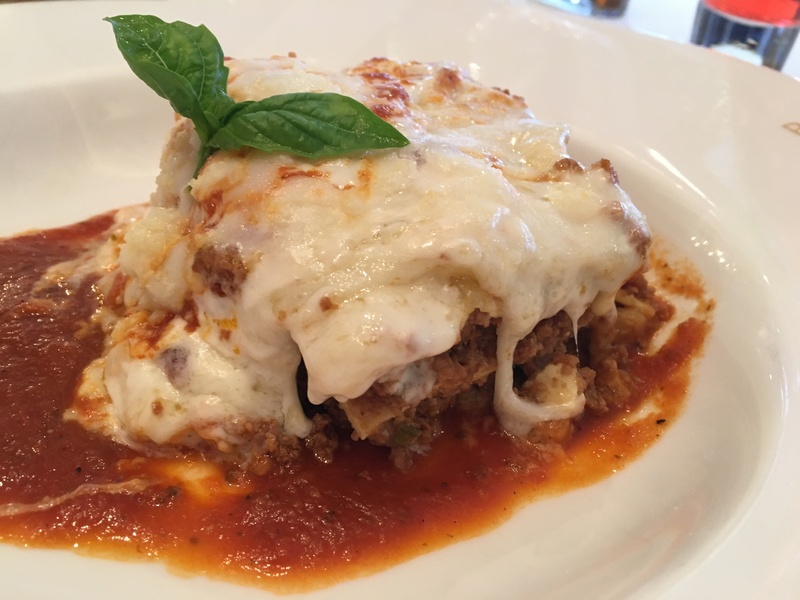 The first time I tried the lasagna bolognaise and it was one of the best lasagna I’d ever had. 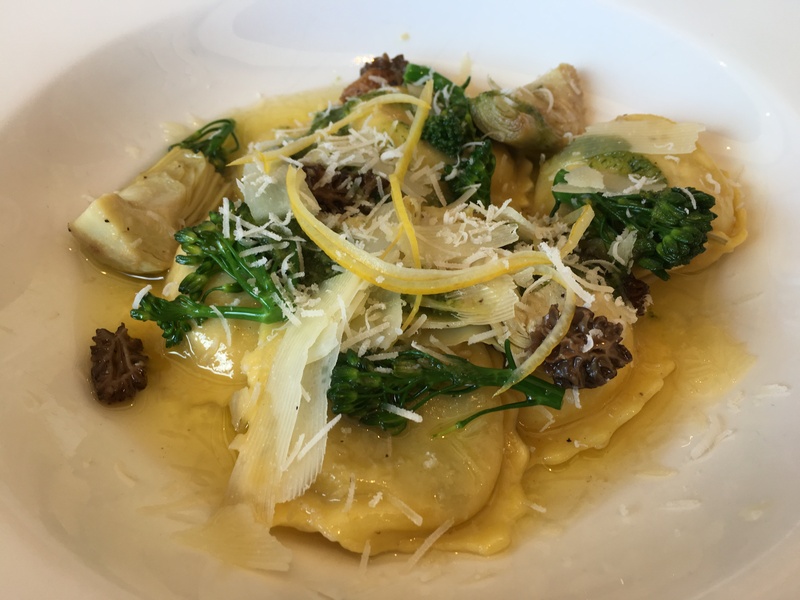 Next time I tried the artichoke ravioli (both suggestions by Ilaria) and it was equally delicious and just the opposite. While the lasagna was SUPER rich and filling, the ravioli was light and delicious while still leaving room for plenty of dessert. Cassie had the roasted red snapper which was cooked just right and tried the three cheese omelet with tomatoes and onions and she loved it. I tried the waffle which was good but not the best waffle I’ve had, but I didn’t mind because everything else was SO delicious. Cassie has a gluten sensitivity so we weren’t sure what she could have at an Italian restaurant. Turns out PLENTY. About 75% of the buffet items were naturally gluten-free and for dessert they prepared a special gluten-free plate for her which she loved. The entrees were also abundantly gluten-free including the waffles and pancakes. The chef came out and guided her around the buffet and showed her exactly what was available. We had such a great time and enjoyed the food so much that we joined up with our new friends and table mates, Kendle and Chad for a couples brunch together later in the cruise. It was great. You can book your Palo experience in advance and I would definitely suggest it. While you usually can book a table once you board, you’ll find the best times available if you do it ahead of time. You can also generally book both brunch and dinner, but be sure not to skip Palo brunch if at all possible. If you get the chance, take advantage of this yummy, romantic, and fun meal on board the Disney Cruise. And ask for Ilaria and tell her we sent you.